Around 6 months ago I received a call from Darren to say that he and his fiancé were off to South Africa in the new year to get married. They were planning on a big wedding celebration party on their return at the end of February and he was looking for a cake. I took the call in the usual way, making notes and flicking through my diary. He then asked if he could come and see me as he had an idea but wanted to run it by me to see if it was possible and it involved shoes! Being a lover of shoes myself (I’m female after all), I was intrigued as to what ideas a man could have involving cake and shoes. Apparently, the cake had been left for Darren to organise and Anna knew nothing about the design. Darren came over one morning and put a rather nice looking ‘Irregular Choice’ purple boot onto my kitchen island (don’t worry, I have anti bacterial spray practically on tap!). I was instantly drawn towards the stunning rich purple colour and unique design. My first words were ‘wow, I want a pair, no, I NEED a pair!!!’. 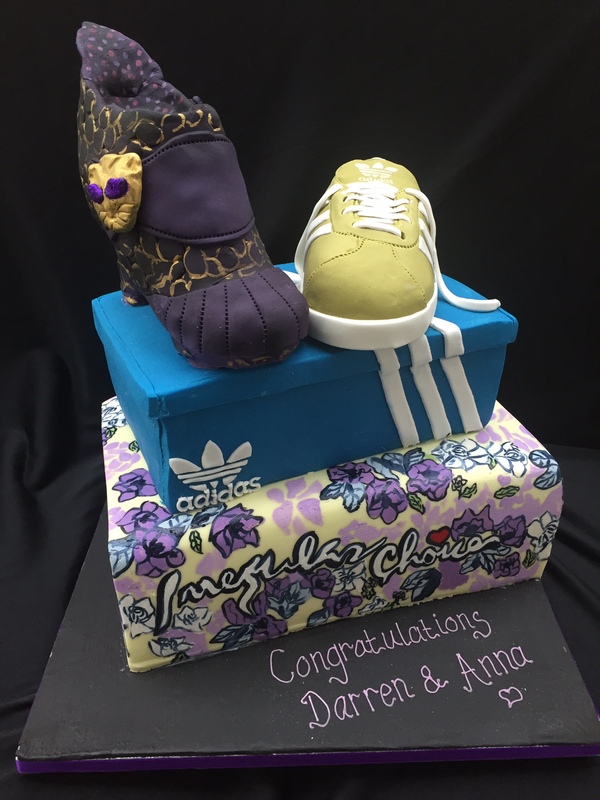 The significance behind the shoes was Anna’s love for buying and wearing ‘Irregular Choice’ and Darren is known for his Adidas Gazelles. He wanted a cake to feature the shoes so I suggested having shoe boxes stacked on top of one another with one of each shoe on top. He loved the idea. Then I Googled the shoe box and wondered how on earth was I going to replicate this, particularly as they no longer had the boxes. We had a few days away in Dorset in February and knowing that on my return i’d have just one week to prepare for this challenging cake, I started to give it some thought. I needed a break from baking and late nights but still found my mind doing cake overtime. I lay awake one night with my phone, taking images of the shoe boxes to get the detail of every angle and pattern possible. I then researched into making larger shoes for cakes as they couldn’t be too heavy and would need to hold. Finally, by 1.30am, feeling exhausted I was confident that I could pull it off. I started the cake on the Wednesday evening by making the shoes and gradually worked on them over the next couple of days. Once the cakes were baked, I iced them and stacked them and then sat with my paint brushes, food colours, looked at the clock for the final time and with the TV on in the background, began to paint. I finally finished the cake at 3am on the Saturday that it was due to be collected. My adrenalin had kicked in and tiredness hadn’t even come into it, so I cleaned the kitchen! Darren came to collect the cake ready to take to the venue on the Saturday morning. His reaction, to me made all the hours of research, thinking and physically working worth while. He was quite astounded to the point that he was almost speechless. I felt the usual sense of relief but still found myself saying ‘so…. you like it then?!’. We then discovered that sports cars and large cake boxes don’t mix well, which is another story…………. Darren and Anna had a wonderful wedding and honeymoon in South Africa and party back here with all of their friends around them. Knowing that their cake was so significant to them made me realise why the finer details are important. A little baking tip for you: Whilst in Dorset I visited Lyme Regis and a little deli on the high street where they sell passion fruit curd. I bought some a couple of years ago but wasn’t too sure what I would do with it. If you every have the opportunity to buy some, it makes a wonderful alternative jam filling to a Victoria sandwich, particularly with a lovely generous layer of vanilla butter cream.